1. Menu Planning. Plan your menus one week at a time. This helps you know what you will cook and what evening you will prepare it. 2. Shop Ahead – and Weekly. Part of being ready is having the items to make dinner in your fridge, pantry or freezer. Nothing is more frustrating then boiling the water and browning the hamburger to open the pantry and realize you are missing then noodles for your spaghetti dinner. 3. Prepare Ahead. Many meals can be prepared and then frozen so all you need to do is pull something out of the freezer and put it into the fridge in the morning. Then, by that evening, it will be thawed and you can pop it into the oven for a quick and easy dinner. Now, part of why I posted this topic was really to share what you can do to make meal time quick and easy, but I also posted it because of a great giveaway for bloggers. There are so many giveaways on-line, that I never post about them. However, this is one that anyone who blogs or tweets really should think about trying to snag. 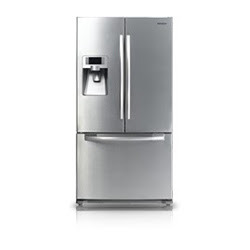 TwitterMoms has teamed up with Samsung and they are giving away a New Samsung French Door Refrigerator! I will say that I must be getting old as the thought of winning such a prize makes me giddy with excitement. I can compare this to the way my children feel on Christmas morning! If you have a blog and are interested, it is really simple to enter. You simply need to make a blog post about this topic: 3 steps to get dinner ready in a hurry. Check out the 4 ways you can enter right here.